U.S. President Barack Obama addressing the BlogHer ’12 conference in New York City on Aug. 2, 2012. One of the great joys of starting a blog is connecting with all of you, and many of you are bloggers, too. One of the big reasons attendees come to the BlogHer conference is to meet other bloggers face-to-face. It’s perhaps the best way to learn more, feel more confident about blogging, and discover new strategies. Right now, as Day One of BlogHer ‘12 gets under way in New York City, I’m reveling in the overwhelm: so many people, so much to look at, so many business cards! It’s so much fun, I’m not letting the information overload get to me; if I miss something, it will probably roll round again. I’m tweeting and updating Facebook, but I also want to keep my head up and my mind open for everything that’s coming my way. Yesterday, we had the extraordinary opportunity to hear a live satellite address from the White House by U.S. President Barack Obama (see the video here). 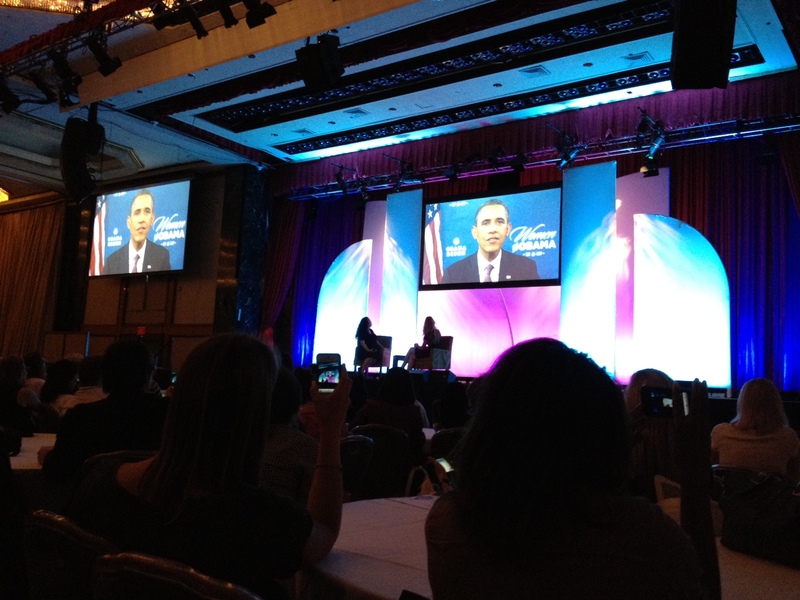 The president first appeared at BlogHer during the 2008 election, and he’s well aware of the power of social media. Like many parents, President Obama said, he and Michelle are concerned about what their daughters see and read online, yet he’s heartened that thousands upon thousands of women “are writing about subjects from family to food to women’s health” through the power of blogging platforms. “It means a lot to Michelle and me,” he said. This isn’t a partisan blog, so I want to let supporters of former Massachusetts Governor Mitt Romney know that although he wasn’t able to speak at the conference, the BlogHer folks are working hard to present an interview with him on their website in the spirit of omni-partisanship. The number one thing that BlogHer bloggers are writing about is their lives. As BlogHer founder Lisa Stone noted, “it’s why there’s such a reader return rate” for blogs. I’m in awe of that 13 percent – what a commitment to themselves as writers! If you’re thinking about starting a blog or attending a blogging conference, you can keep up with BlogHer ’12, including live blogs, podcasts and videos, at the virtual conference: www.blogher.com/blogher-12.